As data continues to grow exponentially, IT managers continue to look for efficient, cost-effective solutions to manage this growth and protect critical business information. De-duplication technologies have emerged as a key weapon in their arsenal and, accordingly de-duplication is now the fastest growing market segment in the storage industry. 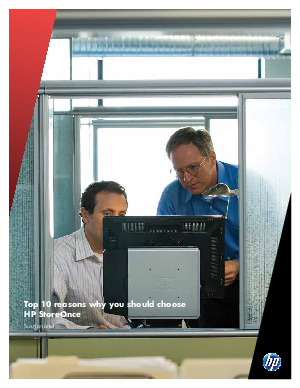 This solution brief sponsored by HP + Intel explains the key business and technical differentiators that have made StoreOnce one of the leaders in the de-duplication market and helped organizations generate impressive total cost of ownership (TCO) metrics.